Argentina and Brazil star Messi-Neymar will get together helping 10 thousand children to eat food. With the World Cup goal they will help the poor children. How much goal they did, they children will get so much money to eat food. It’s really good start of the two nation forward. Both of them are the superstar of the two world championships. Again in Barcelona’s jersey, both of them were genuine friends. Neymar left the Barça, despite the PSG, his friendship with Messi is the same as before. The United Nations has initiated the move to smile on children with these two superstars. As part of the World Food Program, the Messi-Neymar goal will be spent on the food for the lunch of 10 thousand school students. Not Only Russia championship, the program will beat the two stars until March 2020. With this deal, both side Latin American and Caribbean Islands, hungry kids become smiles on their face. They will get to eat properly one time. Argentina and Brazilian stars happy to be associated with such innovative activities.They are very positive to do such type of work. Their reaction was so nice as they linked with the activities. Barca star Messi said mentioned that he felt proud to be in such a great initiative. He also told that normally he did not think, so much of our energy in every goal! But from now he is gonna shoot goal for the great reason. Hopefully he could smile at the face of many children. In Neymar’s words they want children to be assured of food. The PSg star forward also told that they will try to make this plan all the way. He promised to fight together with Messi. As well as standing beside hungry children, two stars have to fulfill their dream of winning the WC trophy this time busy. 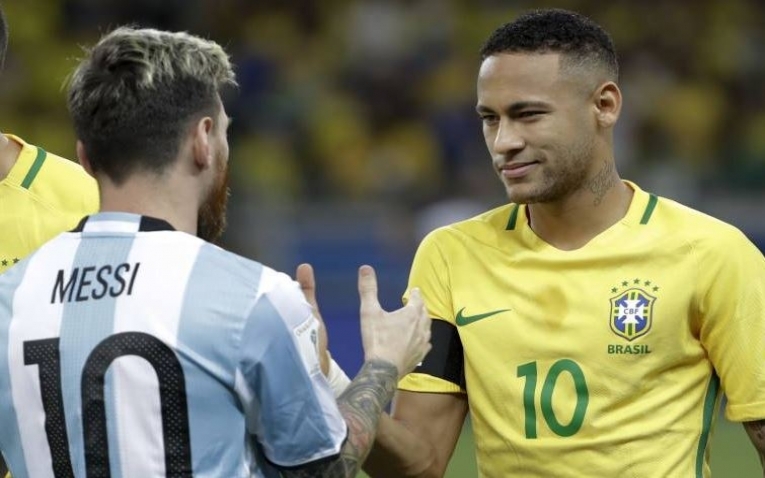 Messi Neymar – Who will be in Russia, the WC trophy, it will be time to say. However, in 1986, WC Legendary captain Diego Maradona advised his successor to be free from all kind of tension. On the other side Jr. is still in injury and after finishing the injury, the Brazil boy will start putting on Russia’s World Cup. Argentina playing in the D group where they fight with Croatia, Iceland and Nigeria in first round. On the other hand Brazil fighting Switzerland, Serbia and Costa Rica in the group E. The both side are great favorite of the tournament.